Aylesbury United ended their derby hoodoo when they won 1-0 at the home of rivals Aylesbury FC on Bank Holiday Monday, despite being reduced to ten men for the majority of the second-half. Sonny French’s well-taken goal on 77 minutes was enough to split the teams in this Evo-Stik League Southern Division One Central match after the Ducks had Taylor Collins sent off in the 50th minute for a second yellow card. On a hot and sunny afternoon, and in front of 291 spectators at Haywood Way, it took a while for El Quackico to get going, with plenty of blood and thunder but a lack of clear-cut opportunities. The Moles were on top for the first quarter and midfielder Keiron Turner, whose performance caught the eye, had the first real chance on 27 minutes as he hit a shot from around 30 yards which went a narrowly wide of the post. The paucity of the first-half was highlighted by the fact that the best chance of the game came just before the break when United keeper Zaki Oualah decided to try his luck from a free-kick. He hit the ball towards goal from the centre circle and it evaded everyone and landed on the roof of the net to conclude a first-half with plenty of niggle but a lack of chances. 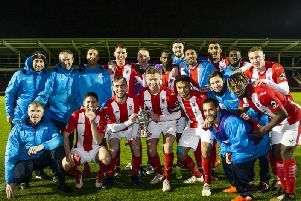 A game which was regularly sparky really bubbled five minutes into the second-half when referee Andreas Anastasiou dismissed United striker Collins for a second yellow card after a foul tackle on FC skipper Ben Stevens. As expected, FC dominated play with the extra man, however too often they seemed to choose the wrong options in the final third. Much to the increasing frustration of the home fans, they struggled to create openings despite the game become more stretched and frantic. Midway through the second period the ten men of United could have taken the lead however nobody was able to get on the end of a cross beautifully whipped in from the right by Ducks sub Reece Cameron. Against the run of play, the breakthrough came for the Ducks on 77 minutes as a ball forward was taken down and finished well into the left corner by French giving the visitors a surprising lead. Despite the Moles’ best efforts, they were restricted to shots from distance which cleared both the crossbar and the stand. On the final whistle, there was audible frustration from the home fans but real delight for the visiting players and supporters at getting the Aylesbury derby bragging rights for the first time at the ninth attempt. The result takes Aylesbury United up to sixth with 12 points from six games in Division One Central, while rivals FC are languishing down in 17th having picked up just four points so far. Neither are in action this weekend due to the FA Cup.